Tarek ibn Ziyad Academy – An Islamist Charter School in Minnesota? Of the several problematic Arabic-language schools in the United States, the Tarek ibn Ziyad Academy stands out as the outstanding example of a taxpayer-funded Islamic school. Not being a traditional public school but a charter school, it has more room to maneuver, but it shows alarming features. First, its principal, Asad Zaman, is connected to the Muslim American Society, the American branch of the Muslim Brethren, founded in Egypt in 1928 and perhaps the largest, most dangerous Islamist organization in the world. a visitor might well mistake Tarek ibn Ziyad for an Islamic school. Arabic as a second language is mandatory. Headscarves are voluntary, but virtually all the girls wear them. There is a carpeted prayer space in the middle of the building that is similar, Zaman says, to spaces provided by several Minneapolis public schools. And there is the vaguely religious-sounding language used in the school. At one point, a conversation with Zaman is interrupted by the intercom: "Sister Zamia, please call the office. Sister Zamia, 2-2-1." "[Muslims] refer to everyone as a 'brother' or a 'sister,' " he explains. "We are all children of Adam." Boys in uniform khaki pants and girls in headscarves and modest dresses line up neatly to go to Arabic class. The mostly Somali class carefully circumnavigates the carpeted prayer area in the middle of the school as they follow a scarved teacher. Tarek girls aren't required to wear hijab, or headscarves, but almost all do—they say they want to imitate their mothers or teachers. About half of the teaching staff is Muslim and wear hijab; the others are mostly Christian and dress modestly but with uncovered heads. During Ramadan, all the children follow the traditional dawn-to-dark fast, so there's not so much temptation for each child, [parent Eman] Ibrahim said. A class at the Tarek ibn Ziyad Academy, Inver Grove Heights, Minnesota. About 1 p.m. every day, Tarek students stream out of classrooms, clean up in the restrooms, kneel down facing the east and begin to pray. Zaman says he doesn't track students' religion, but almost all children participate in the daily prayer. … The school's calendar and day are set up to accommodate Muslim students. Classes break during the noontime prayer; vacation days are scheduled on Muslim holidays instead of traditionally Christian ones. The cafeteria is free of pork and other foods Islam prohibits. The name of the school itself is also based in religion. General Tarek ibn Ziyad's bloody battle marked the beginning of the Muslim rule of Spain in the eighth century. He famously burnt the boats his army used to cross the Mediterranean sea. What happens when a religious association, such as a Muslim group, opens a new charter school outside Minneapolis supportive of and sensitive to the culture of Islam—its values, beliefs, and leaders—without its being a Muslim religious charter school? How does this school walk the fine line between serving a public purpose (educating children in a sensitive, culturally specific, values-oriented program) and being an Islamic religious school? The authors answer their own question: "The existence of a religious charter school like the Ziyad Academy could well lead to a string of new religious/cultural charters. Its mission, as stated on the school's Web site, is clear and values-oriented, but not related solely to religion." Aug. 24, 2007 update: With a reported waiting list of about 1,500 students, Tarek ibn Ziyad Academy has decided to expand beyond its Inver Grove Heights base and open a second Arabic-language school on Sept. 4 in Blaine, Minnesota, a northern suburb of the Minneapolis-St. Paul metropolitan area. "Parents in the north suburbs have been watching our progress over the last four years and suggested that we come to their neighborhood," said Asad Zaman, Tarek ibn Ziyad Academy's executive director. The Inver Grove Heights school has 375 students in K-8; the Blaine school will serve 75 students K-4 students initially and then add a higher grade each year; it will offer the same program, rules, and curriculum as the Inver Grove Heights original. In fact, TIZA was originally envisioned as a private Islamic school. In 2001, MAS-MN negotiated to buy the current TIZA/MAS-MN building for Al-Amal School, a private religious institution in Fridley, according to Bruce Rimstad of the Inver Grove Heights School District. But many immigrant families can't afford Al-Amal. In 2002, Islamic Relief—headquartered in California—agreed to sponsor a publicly funded charter school, TIZA, at the same location. TIZA claims to be non-sectarian, as Minnesota law requires charters to be. But "after-school Islamic learning" takes place on weekdays in the same building under MAS-MN's auspices, according to the program for MAS-MN's 2007 convention. At that convention, a TIZA representative at the school's booth told me that students go directly to "Islamic studies" classes at 3:30, when TIZA's day ends. There, they learn "Qur'anic recitation, the Sunnah of the Prophet" and other religious subjects, he said. TIZA's 2006 Contract Performance Review Report states that students engage in unspecified "electives" after school or do homework. Publicly, TIZA emphasizes that it uses standard curricular materials like those found in other public schools. But when addressing Muslim audiences, school officials make the link to Islam clear. At MAS-MN's 2007 convention, for example, the program featured an advertisement for the "Muslim American Society of Minnesota," superimposed on a picture of a mosque. Under the motto "Establishing Islam in Minnesota," it asked: "Did you know that MAS-MN ... houses a full-time elementary school"? On the adjacent page was an application for TIZA. 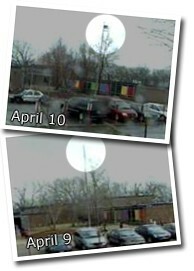 I spent an hour and a half in the parking lot of the school last Monday[, March 3]. The building is a former elementary school – TIZA's name is on one side and maybe 30-40 feet away is Muslim American Society-Minnesota's name. An aerial photo shows the structure is one building. I watched parents come in and go out of this building and they did not differentiate between the part ascribed to TIZA and the part ascribed to MAS-MN, i.e., more parents brought kids out of the MAS-MN side than out of the school entrance before 3:30, when the school day supposedly ends. Actually, very few children came out of the building before 4:15, when religious instruction is over. In other words, the students moved from TIZA classes to "Islamic studies" inside the building, and didn't need to exit to get from one side to the other. No buses (there are apparently 7; I saw 6 that day) leave before 4:30 p.m., though the school day ostensibly ends at 3:30. A bus driver told me that "the students have Islamic studies till 4:15," though some do opt out. I noted that the kids at the Blaine campus also stay until 4:30. TIZA uses the language of culture rather than religion to describe its program in public documents. According to its mission statement, the school "recognizes and appreciates the traditions, histories, civilizations and accomplishments of the eastern world (Africa, Asia and Middle East)." But the line between religion and culture is often blurry. There are strong indications that religion plays a central role at TIZA, which is a public school financed by Minnesota taxpayers. Under the U.S. and state constitutions, a public school can accommodate students' religious beliefs but cannot encourage or endorse religion. TIZA raises troubling issues about taxpayer funding of schools that cross that line. The school is in huge demand, with a waiting list of 1,500. … TIZA has improved the reading and math performance of its mostly low-income students. That's commendable, but should Minnesota taxpayers be funding an Islamic public school? Islamic Relief-USA, the school's sponsor, is compared to the Red Cross in several TIZA documents. In 2006, however, the Israeli government announced that Islamic Relief Worldwide, the organization's parent group, "provides support and assistance" to Hamas, designated by the U.S. government as a terrorist group. Meanwhile, MAS-MN offers on its web site "beneficial and enlightening information" about Islam, which includes statements like "Regularly make the intention to go on jihad with the ambition to die as a martyr." At its 2007 convention, MAS-MN featured the notorious Shayk Khalid Yasin, who is well-known in Britain and Australia for teaching that husbands can beat disobedient wives, that gays should be executed and that the United States spreads the AIDS virus in Africa through vaccines for tropical diseases. Yasin's topic? "Building a Successful Muslim Community in Minnesota." Mar. 18, 2008 update: Kersten's article prompted the American Civil Liberties Union of Minnesota to open its own investigation of the academy. It explains in a letter to the principal, Asad Zaman, its concerns about Establishment Clause violations. At a minimum, the ACLU requests, the school "must discontinue recruiting volunteers for Friday Prayers, and must not be involved in promoting or providing special treatment to groups providing religious instruction after school hours." Apr. 8, 2008 update: Kersten published the twenty questions she posed to Asad Zaman, TIZA's executive director, followed by his replies. Arriving on a Friday, the Muslim holy day, she says she was told that the day's schedule included a "school assembly" in the gym after lunch. Before the assembly, she says she was told, her duties would include taking her fifth-grade students to the bathroom, four at a time, to perform "their ritual washing." Afterward, Getz said, "teachers led the kids into the gym, where a man dressed in white with a white cap, who had been at the school all day," was preparing to lead prayer. Beside him, another man "was prostrating himself in prayer on a carpet as the students entered." "The prayer I saw was not voluntary," Getz said. "The kids were corralled by adults and required to go to the assembly where prayer occurred." Islamic Studies was also incorporated into the school day. "When I arrived, I was told 'after school we have Islamic Studies,' and I might have to stay for hall duty," Getz said. "The teachers had written assignments on the blackboard for classes like math and social studies. Islamic Studies was the last one—the board said the kids were studying the Qur'an. The students were told to copy it into their planner, along with everything else. That gave me the impression that Islamic Studies was a subject like any other." After school, Getz's fifth-graders stayed in their classroom and the man in white who had led prayer in the gym came in to teach Islamic Studies. TIZA has in effect extended the school day—buses leave only after Islamic Studies is over. Getz did not see evidence of other extra-curricular activity, except for a group of small children playing outside. Significantly, 77 percent of TIZA parents say that their "main reason for choosing TIZA ... was because of after-school programs conducted by various non-profit organizations at the end of the school period in the school building," according to a TIZA report. TIZA may be the only school in Minnesota with this distinction. Kersten goes on to point out the Minnesota Department of Education's education negligence in allowing this clear breach of use of public monies. TIZA's operation as a public, taxpayer-funded school is troubling on several fronts. TIZA is skirting the law by operating what is essentially an Islamic school at taxpayer expense. The Department of Education has failed to provide the oversight necessary to catch these illegalities, and appears to lack the tools to do so. In addition, there's a double standard at work here—if TIZA were a Christian school, it would likely be gone in a heartbeat. She concludes with this warning: "TIZA is now being held up as a national model for a new kind of charter school. If it passes legal muster, Minnesota taxpayers may soon find themselves footing the bill for a separate system of education for Muslims." In response to the Kersten column, Channel 5 interviewed Getz and TIZA executive director, Azad Zaman. Getz observed: "I've been in a lot of schools and I've never been in a school where they had washing rituals, or they had prayer, or where they had a room where you had to take your shoes off." To which Zaman retorted: "It is most likely that this substitute teacher was sadly mistaken." He also stated that "TIZA does not endorse any religion" and that the school follows state and federal guidelines concerning religion. "We're required under the federal guidelines to allow students to pray when they wish to do so. And as Muslim students, they're allowed to pray around 1:30 p.m., so we allow them to do that." Also this tidbit uncovered by Channel 5 reporter Beth Jett: Although Minnesota tate law requires schools to fly an American flag during school hours, TIZA flies no flag. Asked about this, Zaman explained that he does not know how to work a flagpole. Comment: Thanks to Kersten's determined investigation of the Tarek ibn Ziyad Academy, we on the outside know more about it than any other tax-funded American madrassah. This school, rather than the Khalil Gibran International Academy, about which we know so little, should be the one at the focus of a national debate. The flagpole at the Tarek ibn Ziyad Academy. Apr. 10, 2008 update: That tidbit about the flag had immediate consequences – leading to an American flag flying over the school a day later, and for the first time since TIZA opened doors in 2003. This occurred despite the school's lawyers insisting that a charter school need not fly the flag. A school attorney also admitted that staff and parents had a difficult time of it after the Kersten column, as outraged citizens around the country flooded the school with messages of anger. Apr. 12, 2008 update: Thanks to the blogosphere, the Kersten article of April 9 has received close to a million hits – and a good number of readers have contacted TIZA to express their unhappiness. Zaman reports that the school has received harassing and threatening calls and the police are adding extra patrols in its area. We also learn that TIZA is projected to receive $3.8 million for the 2007-08 school year. Apr. 14, 2008 update: The Council on American-Islamic Relations wants the Federal Bureau of Investigation to get involved, to investigate whether reported threats against TIZA are hate crimes. Apr. 17, 2008 update: "These vile and vicious attacks on us have resulted in death threats against my students, myself and my family," says Asad Zaman. To which Katherine Kersten replies that while threats are "repellant," they should not "distract attraction from the central issue here, and that is, whether this publicly-financed school is skirting or breaking the law that all others must observe when it comes to religious endorsement. If this were a bunch of Baptists or Catholics with the kids being led to the rosary on Mondays through Thursday and led to Mass on Fridays there wouldn't be any question that this is crossing the line." said Minneapolis Star-Tribune columnist. As for Minnesota Education Commissioner Alice Seagren, she has issued a statement that "We take seriously the concerns raised regarding Tarek ibn Ziyad Academy and are conducting an appropriate review." May 19, 2008 update: Two major developments took place today. (1) The Minnesota Department of Education sent TIZA a 5-page letter and 4-page "findings report" concerning the school's Islamic nature. While the department found "most of TiZA's operations … in compliance" with state and federal laws, the department "did identify items of concern" and "directs TiZA to promptly take appropriate steps to address these issues." Those items of concern are: Friday communal prayer and student transportation at the end of the day. (2) To report on the MDE letter and report, television station KSTP sent a Channel 5 Eyewitness News team to TIZA, where it met a hostile and even violent reception. In an attempt to report about the new findings from the Department of Education, 5 EYEWITNESS NEWS went to TiZA. While on school grounds, our crew was attacked by school officials. Our photographer was injured while wrestling with the two men over the camera. Our photographer was examined by paramedics and suffered minor shoulder and back injuries. 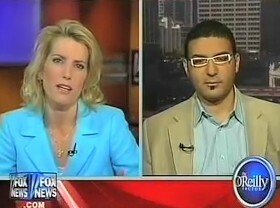 Laura Ingraham interviews Ahmed Rehab about the Tarek ibn Ziyad Academy in Minnesota. there's really no controversy here whatsoever. You guys are making a mountain out of a mole hill. Basically, there were allegations leveled against the school. There was a pending investigation by a neutral entity, and objective entity. That the investigative team by the State Department of Education. And the results of that investigation found only two minor violations, nothing major, nothing of the sort that was described in the segment. And so there is no problem. … there is no issue here. REHAB: … in regards to the so-called interview that they tried to carry with the school on the grounds, the camera attacked the grounds without further notification or prior notification. I think it is basic journalistic ethics. INGRAHAM: Wrestling the cameraman to the ground. He had to get medical help. REHAB: ...you have admissions from the school or from the parents. REHAB: OK, and so they were trespassing. What do you do with trespassers? You hand them a bouquet of roses. They were trespassing on private ground. INGRAHAM: Well, this was a charter school and funded by the taxpayers. So this is not private property. That's the big problem here. REHAB: And it won an award for its management. INGRAHAM: Taxpayers pay for it. In the same hallway as [the eighth-grade] classroom is an empty room where students pray for about five minutes Monday through Thursday. The room resembles an empty box with only green carpet and a blank chalkboard. On Friday — the Muslim holy day — students gather in the school gym for a 30-minute prayer time. All prayer is voluntary, and although teachers can pray with students, no school officials lead the prayers. [Principal Asad] Zaman does not participate. The state education department had no issue with the prayer arrangement except for Fridays because it may prevent students from fulfilling the state's minimum hourly attendance requirement and takes place in a public school building. Inver Grove Heights resident Kevin Sorensen shares similar concerns with the school's critics. "They may not be teaching religion," he said. "But it sure seems like it to me. I can't really tell the difference." The school accepts public funds, and thus the broader constitutional requirements placed on all public schools. Nonetheless, in many ways it behaves like a religious school. The school is named for the Muslim general who conquered Spain in the eighth century. It shares a building with a mosque and the headquarters of the Muslim American Society of Minnesota. The cafeteria serves Halal food. Arabic is a required subject. There is a break for midday prayers. On Fridays, many students join with Muslim teachers and attend religious services in the school's gym. There are voluntary Islamic Studies classes held "after" school, but before the buses leave to take the school's 400 students home. Most of the students are the children of low-income Muslim immigrants. Kersten criticizes the investigation by the Minnesota Department of Education. the report was flawed in important respects. Most significantly, it was silent about the school's close entanglement with the religious organization with which it is affiliated. It's a safe bet that if the school in question here were essentially a Catholic school, this wouldn't be a debate. Imagine a public charter located in the headquarters building of the Archdiocese of St. Paul and Minneapolis. Its principal is a priest and its board chairman is the archbishop. Catholic students there "are comfortable asking questions about their own religion." Latin is required, and the cafeteria serves fish during Lent. Students break for prayer and attend Mass during the school day, and buses leave only when after-school Catholic Catechism classes are over. Such a school would never open. But with Tarek ibn Ziyad Academy we have something different. It's held up as a model, "religiously sensitive" public school. It is justified in terms of culture and "religious accommodation." Minnesota education officials need both the backbone and the oversight tools necessary to prevent the blurring of lines between Islam and the public schools. If they continue their tepid response, a separate system of taxpayer-financed education for Muslims may take root here. Tarek ibn Ziyad Academy could be the first of many. Sep. 5, 2008 update: TIZA will change its student prayer sessions on Fridays when it opens this fall. It will shorten them and have staff members pray separately from students in another room, Zaman wrote in a letter to the Minnesota Department of Education. Staff members would only be present during student prayers to ensure student safety. To this proposal, the department replied that the planned change may suffice and indicated its intent to visit the school to make sure the changes are in fact made. Sep. 10, 2008 update: Katherine Kersten writes in "Storm brewing between state officials and Muslim school" that an apparent understanding between TIZA and the Minnesota Department of Education on not promoting Islam at the public school hides tensions between the two parties. She quotes Chas Anderson, deputy MDE commissioner, saying that one key issue remains unresolved – the school's 30-minute Friday communal prayer – and that the department will be closely monitoring TIZA. The prayer service is led by adults, conducted on school premises, and attended by students and teachers alike. Anderson notes that since May, MDE has been negotiating with the school for changes. "We wanted TIZA to do Friday prayers the way all other public schools [handle similar activities] – as release time." Release-time means that students move off the school property for their religious activities. TIZA rejected this submission to state law, Anderson reports, insisting that Friday prayer be held on premises. The principal, Asad Zaman, wrote in a letter to the MDE that students will lead the prayers and school staff will be present "to ensure student safety." Anderson complaining of the letter's "defensive tone" and wrote firmly back. "It is inaccurate for TIZA to imply that MDE's legal concerns regarding the school's operations ... were unfounded, and it is of utmost importance that TiZA take seriously its responsibility to comply with applicable state and federal laws." To this, TIZA only replied it will shorten Friday prayers,without saying by how much. As far as it is concerned, the issue is settled, issuing a statement saying that it "reached agreement with the Department of Education ... and will continue to work with the department to ensure that we continue to be in compliance with all state and federal laws." The department remains skeptical of TIZA'S proposed arrangement, however. Anderson is "very troubled by it. This may look good on paper. But how can you have an assembly with older students in charge of younger students?" As a result, the MDE plans to watch the situation closely, including on-site visits. Jan. 12, 2009 update: Best one-liner of the whole affair, by Scott W. Johnson of PowerlineBlog.com: "One might say that TIZA is an Islamic school in all but name, except that the name is of course Islamic." that the operation and public funding of the Tarek ibn Ziyad Academy ("TIZA") is unconstitutional as a violation of the Establishment Clause of the First Amendment to the U.S. Constitution; and of Article 1, Sec. 16 and of Article 13, Sec. 2 of the Minnesota Constitution; and that the leasing of space by Muslim organizations to TIZA and the resulting transfer of state funds intended for the support of charter schools to such Muslim organizations through excessive lease payments also violates the Establishment clauses and Minnesota Stat. §124D.10. "This is not a sectarian school that focuses on Middle Eastern culture This is a pervasively Muslim school that teaches religion." The Minnesota Department of Education was named in the suit because it failed to oversee the school: "We're doing their job. We shouldn't have to be filing this lawsuit." Comment: Congratulations to Chuck Samuelson and his staff for bucking the ACLU habit of ignoring the Islamist danger. A seven-digit aid deduction would be a "significant" loss for any charter school, TiZA spokesman Darin Broton said Thursday, but he did not say whether a penalty that large would effectively shut down the school. The state estimated earlier this year that the school would get more than $4 million in aid for the 2008-09 school year. July 17, 2009 update: Whoops, withholding that money was all a mistake writes the deputy Minnesota education commissioner, Chas Anderson, to Asad Zaman of TiZA. Anderson's letter explains that the Minnesota Department of Education has just sent $124,750.81 to TiZA and he apologizes for the error. In the six months since the [ACLU] suit was filed, TiZA has fought tooth and nail—erecting procedural barriers to prevent the ACLU from investigating what goes on there. The school's efforts to avoid public scrutiny are part of a well-established pattern. TiZA's staff handbook requires silence about the school's internal operations, according to the ACLU complaint. Staff members who speak publicly without permission are threatened with disciplinary action, including immediate termination, and with legal action if they reveal details even after they leave the school's employ. Does that sound like the public, taxpayer-financed school down your block? Kersten goes on to speculate about two reasons for TiZA's "obsession with secrecy": the school may be "funneling state funds to an activist Islamic organization and [it] has connections to a controversial imam whose mosque is under scrutiny in the case of the disappearing Twin Cities Somali youths." She then fleshes out these connections. July 21, 2009 update: U.S. District Judge Donovan Frank considered the ACLU lawsuit against TiZA and the Minnesota Department of Education, leaving the former charges intact but dismissing the latter. July 22, 2009 update: "Islamic nonprofit paid for Rep. Ellison's pilgrimage to Mecca" reads the headline in the Minneapolis Star Tribune. Turns out that U.S. Rep. Keith Ellison (Democrat oft Minnesota) tried to keep secret the fact that his hajj was paid for by the Muslim American Society of Minnesota, the same organization that received $329,000 in 2006 and $550,000 in 2007 to lease space in its building to TiZA. Oh, and Ellison's companion to Mecca, Asad Zaman, is the executive director of TiZA as well as president of the Muslim American Society when the hajj was planned. Dec. 10, 2009 update: U.S. District Judge Donovan Frank rejected the claim that the ACLU defamed TiZA. Indeed, TiZa receives public funds and so is a governmental body and cannot sue for libel, he ordered. Jan. 29, 2010 update: The Minnesota Department of Education reinstated a $375,000 grant to TiZA after having suspended the funds for reasons having to do with teacher-license requirements. Oct. 16, 2010 update: Katherine Kersten reviews the situation in "TiZA vs. the search for truth: The school—public, mind you—tries to intimidate all who would challenge it" in the Minneapolis Star Tribune. The battle over the role of Islam in a Minnesota public school is heating up again in a federal courtroom in St. Paul. The conflict began in January 2009, when the ACLU of Minnesota sued Tarek ibn Ziyad Academy. … TiZA since has fought tooth and nail—erecting procedural barriers to prevent the ACLU from investigating what goes on behind its doors. The school's tactics have gone far beyond the usual rough-and-tumble of lawyers in our adversary system. Its chief tool has been attempted intimidation of all who would draw back the curtain on its secrets. One of TiZA's first targets was the ACLU itself. A few months after the suit began, the school filed a $100,000-plus defamation claim, citing ACLU executive director Chuck Samuelson's simple statement that "[TiZA is] a theocratic school ... as plain as the substantial nose on my face." The court dismissed the claim. In January 2010, the ACLU was back in court to seek a protective order, on grounds that intimidation by TiZA was discouraging potential witnesses from appearing. The ACLU filed affidavits by a former TiZA parent and a former TiZA staff member, who described what they interpreted as threats of violence against them. In her affidavit, the female staff member said that Asad Zaman—TiZA's executive director—had suggested after she displeased him: "We could just kill you, yeah tell your husband we'll do his job for him." (Zaman has no recollection of making such a statement, he said in an affidavit.) The court barred witness harassment or intimidation by either party. In June 2010, the ACLU returned to court to quash what it described as yet another TiZA attempt to intimidate current and former employees from speaking about what they had seen at the public school. TiZA's "Staff Handbooks include a secrecy clause, and related threat of legal action for violating it," according to the ACLU's court filings. TiZA "wields [these provisions] as a sledgehammer to keep former employees quiet about what they saw at the school." As a result, "former TiZA employees have expressed fear about speaking to the ACLU." According to the ACLU, TiZA's refusal to agree not to enforce the secrecy clause "sends the ominous signal that current and former employees who talk to the ACLU may be forced to defend themselves against a baseless, expensive lawsuit." On Oct. 1, Judge Donovan Frank agreed—affirming an order the ACLU had earlier won barring TiZA from enforcing the confidentiality clause in the context of this litigation. The court's order and memorandum spoke volumes: "It appears that information related to TiZA's business, finances, operations and office procedures is public data and cannot be kept secret." "The relevant question ... is why TiZA, a public charter school, does not want to allow its former and current employees to participate in the informal discovery process to ascertain the truth about how TiZA operates." The court's strong language in response to TiZA's actions was unusual: "[I]ntimidation and threats will not sit well with a fact-finder such as a jury." As a result of the school's actions, "[T]he Court may be required to draw adverse inferences about how TiZA operates as a result of TiZA's efforts to keep information about its operations secret. ... [TiZA's] behavior during the discovery process thus far ... has not been consistent with a good faith search for the truth." Several organizations that are not even parties to the lawsuit went to court in an attempt to disqualify the ACLU's lawyers—Dorsey & Whitney—from representing the ACLU on grounds that Dorsey personnel had previously communicated with Zaman about entities involved in the litigation. The organizations include the Muslim American Society of Minnesota (MAS-MN), MAS-MN Property Holding Corporation and the Minnesota Education Trust (MET). What might they fear? Perhaps that Dorsey lawyers are in a position to prove that the scandal thus far—and Zaman's role in it—is just the tip of the iceberg. To this, Dorsey & Whitney replied: "The ACLU believes Mr. Zaman's testimony relating to control of virtually every significant event at TiZA, MAS-MN, MET and MET's subsidiaries, coupled with his efforts to hide such control, constitute powerful evidence against TiZA's denials that it is a Muslim school and that it funnels state and federal money to other Muslim organizations." As Kersten concludes, "Every time we read about this lawsuit, we have to pinch ourselves and say: We're talking about a public, taxpayer-funded school." June 30, 2011 update: I have skipped reporting on TiZA's many legal wrangles with the ACLU and the State of Minnesota but return to them now as the school appears near closing. "TiZA's future bleak after loss in two key decisions: TiZA school loses dual decisions, leading to likely closure. Rulings target qualifications of school's required overseer" writes Sarah Lemagie in the Star Tribune. The school filed for bankruptcy under Chapter 11, which businesses typically use to seek protection from creditors while attempting to reorganize. It was the school's only way to "protect its mandatory financial obligations to its staff and to properly address the many issues it now faces," the school said in a statement. Comment: Curious how the two leading Islamist school efforts in the United States, Khalil Gibran International Academy and Tarek ibn Ziyad Academy, are collapsing simultaneously. Aug. 3, 2011 update: The Tarek ibn Ziyad Academy saga is over. The TiZA board decided not to appeal a state decision that forced its closure. Instead, the school will proceed with what its lawyer called an "orderly winding-down" of operations. He asked the ACLU to end its lawsuit and "allow the parties to move on with their lives." But the ACLU indicates it might sue for reimbursement of attorneys' fees, currently exceeding $3 million. Aug. 3, 2012 update: TIZA and the ACLU settled their outstanding three-year lawsuit. Asad Zaman will repay the state $17,500, drop his $360,000 in claims, and agree not to hold a leadership position in a charter school for three years. On New York's "Khalil Gibran International Academy"